Twenty four states have some version of a “Share the Road” plate. 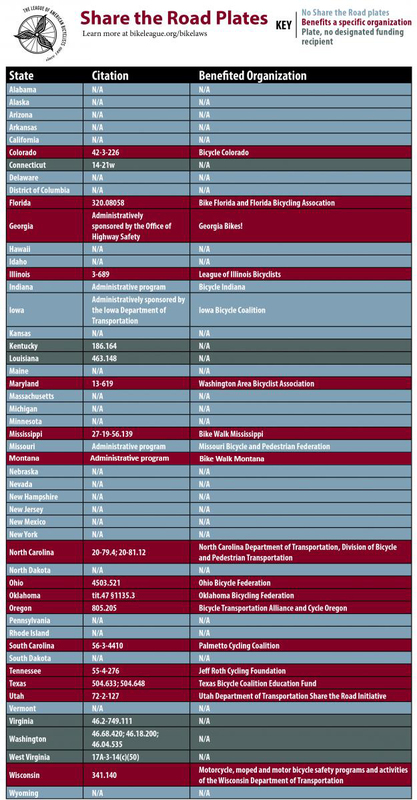 In 15 of those states, a bicycling advocacy organization is identified in the law or otherwise to receive funds from the program. In two states, Connecticut and West Virginia, a law is on the books but there is currently no way to purchase the specialty plates. Where did they come from? The first state to issue a Share the Road plate was Florida in 1999. For more information on how Share the Road plates began please visit this website: http://sharetheroad.org/the-story/. As of the last revision to the Uniform Vehicle Code (UVC) in 2000, there is no UVC section relevant to the creation and operation of a share the road license plate program. Mississippi is one of 11 states that designate a bicycling advocacy organization as the recipient of funds produced from the sale of “share the road” specialty license plates. The Mississippi law also gives its chosen bicycling advocacy organization, the Bicycling Advocacy Group of Mississippi, better known as Bike Walk Mississippi, an advisory role in the design of the plates. In Iowa, an organization can get a specialty license plate through either a law or administrative process. The Iowa Department of Transportation (DOT) sponsored the Iowa Bicycle Coalition to create a specialty plate administratively. The Iowa Bicycle Coalition had complete control over the design of the plates, but had to pre-sell 500 plates in order to complete the administrative process. There are now more than 1,300 Share the Road plates on the road and it is the second highest selling specialty plate in the state.